"History and Explanation of the picture "The Broad and The Narrow Way". 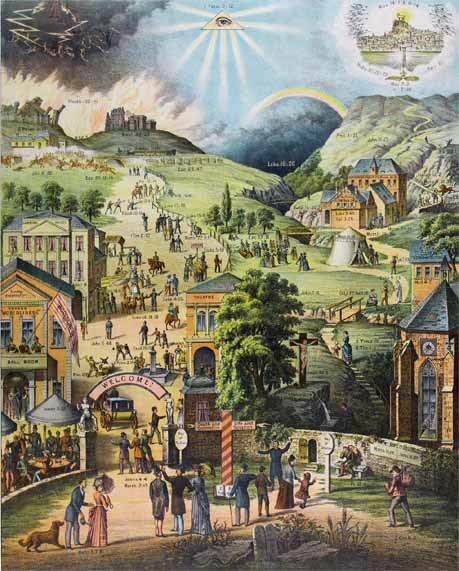 The accompanying Explanation of "THE BROAD AND THE NARROW WAY" Picture was translated from the original German, by Miss Marriott, a Mildmay Deaconess. But as I have been twenty years in finding out what I now know of the origin and history of the picture, it is but right that this knowledge should be placed within the reach of others. hence the following Narrative has been prepared. My first visit to the Continent was in August, 1867, when, in the providence of God, I attended the Fifth General Conference of the Evangelical Alliance, held for ten days in Amsterdam. This led to two other visits in the two following years by invitation of Dutch friends, so that altogether I spent ten weeks in Holland. Two important results followed, viz. : the revival there of open-air preaching; and the bringing to England of "My Dutch Picture." THE DUTCH AND STREET PREACHING. With reference to the first result, I need only say here that, though threatened with imprisonment if I attempted street preaching, yet on my second visit it was allowed by the authorities, and taken up by the Dutch themselves, led by Mr.Isaac Esser, of the Hague. Such a complete change was wrought thereby, under the blessing of God, in a bad street in the Hague, that the Burgomaster declared, "One good street-Preacher is worth ten policemen "—a saying which has since become famous. WHERE I FOUND THE PICTURE. fellow-labourer. We were the guests of Mr. H. de Hoogh, a kind bookseller, at 76, Nieuwendijk, Amsterdam. Here we arrived on January 31st, 1868. Our host had a Dutch copy of this Picture in his shop window. Next day I saw it for the first time, and was at once attracted by it. Day by day I looked at, and tried to understand its meaning; and I brought a copy to England on my return. Friends to whom it was shown were deeply interested; and soon after, at my request, the Dutch Explanation was translated into English, by Frederick Emmighausen, a young Dutchman, residing in London, and afterwards published. HOW I BECAME ITS EXPOUNDER. enlarged copy painted, succeeded by three others, each larger than its predecessor. The last—the one I now use—was painted by Henry Bevis, scene painter, 140, Pentonville Hill, London, and is nine feet wide and twelve feet long. It is painted in dulled oils, suspended on an ingenious frame, and lighted by a "new quintuple dual illuminator "—five duplex lamps in one - (both invented by Mr. Leonard Todd) placed at its foot. From these copies I have lectured in public 909 times in eighteen years to tens of thousands of people. The Picture has thus been exhibited and expounded, in-doors and out, in the principal towns in England: and last year it travelled "from Land's End to John O'Groat's House;" for I spent eighteen days in Devon and Cornwall, and sixteen in Scotland, taking a fresh town almost every night. The exposition is varied, according to the kind of audience, or by the leading of the Spirit; and it has probably never been twice in the same words during all these years. I am guided chiefly by the original Explanation, but introduce many English incidents and illustrations. I am deeply indebted to my dear friend, Charles L.Young, of Mildmay, who, with unfailing devotion, has accompanied me hundreds of times to point out the objects in the Picture while I explain it, and has sometimes taken my place as expositor also. I am comforted in these manifold journeyings, which necessarily often keep me out late at night, by regarding this exposition as part of my life-work.This is confirmed by the time when the Picture first attracted my attention; for hardly had the grave closed over the earthly remains of the designer when my eyes were directed to her work in the shop window in Amsterdam. Thus the Picture fell from her hands into mine, and began a new life by being turned into a new tongue, and so becoming accessible to the whole English-Speaking world. All my lecturing copies were painted with Dutch texts, and I familiarized the public with the title, "My Dutch Picture." But the words, "from the German," at the end of the Dutch "explanation," led me to enquire about the original; for I found I had only a version of it. For a while all enquiries were fruitless. The first light came on the 15th of August, 1882, from the Rev. C.A.Gollmer, a German missionary, who had long laboured in Africa for the Church Missionary Society, and who died December 23rd, 1886. He informed me that Mrs. Charlotte Reihlen, of Stuttgart, was the original designer, and secured me two copies of the Picture from the German Evangelical Society, By whom it was published. These were accompanied by the original German "explanation," which I then had translated and published in English. THE REAL STORY OF THE PICTURE. At last I obtained the story of the Picture from the family of the designer. It reached me on the 26th of January, 1887, through Baron Julius von Gemmingen, of Gernsbach, to whom I had addressed a series of questions on the subject the previous year.The story is from the pen of Mr. Adolf Reihlen, of Stuttgart. Writing to the Baron, he says "It is a matter of great joy to me to think that this noble picture, the effluence of our memorable mother's deep piety of heart, today inspires thousands so vividly, and with the same freshness for God's Kingdom as it did twenty-five years ago. To my memory it was six years before her death, which occurred on the 21st of January, 1868, at the age of sixty-three, that our departed mother formed the idea of having a noble engraving of THE BROAD AND THE NARROW WAY, that it might be circulated freely among the people. "Our dear mother was, as you know, gifted with very fine taste, but as she knew nothing whatever of the art of drawing, she looked for a pious artist, who would be able to put her ideas on paper with full understanding and inspiration. In this endeavour she continued till she found in the person of Herr Schacher a really pious artist. He was the son of an excellent and godly tutor at the Royal Grammar School here. Dear mother now told him accurately what she wanted; and he designed the chief parts of the Picture. These were again criticised by our dear mother, and altered according to her own mind, till she declared herself fully satisfied. My brother, Theodore, assisted my mother, specially by visiting frequently Herr Schacher; and he also did great service by his taste for the aesthetic in grouping. Herr Schacher died soon after, still a young man. "A real picture in oil or water colours never existed; but the lithograph originated from three or four chief sketches. These original sketches are evidently not in existence now. However, it does not matter much; for I remember distinctly how at the time dear mother only used them as a kind of framework to bring the picture at last into the perfect form. "As to 'an earlier representation of the two ways,' mentioned in the EXPLANATION, I remember from my childhood a picture which bore the title. But that engraving was drawn with little spirit or life, and was rather roughly executed. But it is indisputable that even thirty or forty years previously, this rough engraving contained the principal idea of our dear mother's Picture. However, it was just the endeavour of our dear mother to create in her Picture a richer, a more perfect, and a nobler illustration of the idea. "The 'Explanation of the Picture' originated also from dear mother. In this dear Theodore (now deceased) principally assisted her. It is natural that the Picture and Explanation are from one mould,—I should like to say by inspiration of dear mother, and the assistance of Theodore and the pious artist Schacher." This is a charming tribute to a mother's gifts and graces, and is invaluable as giving the true origin of the picture. It was supplemented by a statement from one of Mrs. Reihlen's daughters,communicated in October, 1887, to Mrs. Pooley, of Bath, by Mr.E. Millard, who has laboured in Austria forty years for the British and Foreign Bible Society "I succeeded only yesterday in getting an interview with Mrs. Stammbach, the daughter of Mrs. Reihlen. It seems that the print, roughly and imperfectly sketched, was found about seventy years ago by a Mr. G. W. Hoffmann (the founder of Kornthal, a place near Stuttgart), among some stray papers, of which no further account can be given. This picture was shown to Mrs. Reihlen, of Stuttgart, as a curiosity. A year or two later several copies of the same print casually fell into her hands with some waste paper. She was impressed by this circumstance, and eventually produced her own Picture, greatly improved and enlarged. A Pastor Israel, still living at Stuttgart, travelling in Holland, took some of these copies with him for circulation. He gave one to Jonkheer A. M. C. van Asch van Wijck, a judge, residing in Utrecht." Dutch, published it in 1867, and sold 10,000 copies. We have thus a clear account, not only of the German origin of the Picture, but of its translation and publication into Dutch. On the 24th of last April Mr. Adolf Reihlen, the writer of the first of these two statements, called upon me at my office (Open-air Mission), and gave me some additional particulars of his mother. She owed her conversion to a German preacher, named Ludwig Hofacker. This change made her husband furious, and he went off to America. There the Lord convicted him of sin, and he returned home, saying, "I was in the wrong; you are right," and henceforth had fellowship with her in the many good works to which her life was devoted. One of them was a Deaconess House, which she founded: another was a Middle-class School for Girls, founded in 1841, in which between 5oo and 6oo have since been educated. These were in Stuttgart, the capital of the kingdom of Württemberg. As they were wealthy, and were now one in the Lord, they gave freely of their substance to the Lord's work. It was not surprising to hear this good son say of so honoured a mother, "I liked her immensely!" He added that two of her favourite books were John Bunyan's Pilgrim's Progress and Richard Baxter's Saint's Rest. Resuming my own narrative, I now come to the production of the English edition of the Picture. After my lectures people naturally wanted the Picture. So when 4,000 Dutch copies had been imported and sold, Messrs. MORGAN AND SCOTT issued an English Shilling Edition, in October, 1883. The size was the same as that of the German and Dutch, viz., nineteen inches by twenty-four, and, like them, it was tinted only. But when a pretty edition in six colours was produced, it became first favourite with the public, and is now the only one printed. So great has been the demand that 50,000 copies have been sold in five years; and it has been carried to the ends of the earth. At the same time (October, 1883) a miniature copy of the Picture was engraved and printed on the title page of the Explanation. The present issue brings the total of this explanation in English to 100,000. Such are some of the results arising from a casual look at a picture in a shop window at Amsterdam by an English visitor more than twenty years ago. But other results of far more importance have followed; for I venture to hope that thousands have been influenced for good, and not a few soundly converted to God by the lecture, the Picture, and the Explanation. This is testified by a considerable number of letters, which I gratefully treasure. But, on the other hand, the Picture has been criticised. Some have found fault because the Cross is introduced; and others that vice is represented as well as virtue. These critics have also suggested several alterations, all of which I have firmly opposed. I regard it as my mission to expound the Picture, and to transmit it to posterity as near the original as possible. It is easy to criticise an allegorical Picture, as no two independent minds would form the same design. But as this is on sound, evangelical, Scriptural lines, I prefer that it should remain unaltered. Admirable as is the arrangement of the hundred texts in the Explanation, and clear as that Explanation generally is, yet some details are left obscure. I am often asked why the Prodical Son is on ground included in the Narrow Way. My own impression is that he is intended to represent a backslider, and hence he is restored and welcomed by his father. Otherwise he must return and come in by the STRAIT GATE. Another unexplained point is the gap in the fence dividing the two ways. I have seen another picture, in German, somewhat after the style of this, in which all in the Narrow Way carried crosses, so that if any turned aside into the Broad Way they were known by this emblem; and my impression is that the preacher in the Broad Road was sent there to restore these wanderers; and that the gap was made for them to return by. The Preacher in the foreground was intended to represent Samuel Hebich, a successful missionary in the East Indies—so Mr. Adolf Reihlen told me. But the one in the Narrow Way, Surrounded by a crowd, is not in the original, but was added by the Dutch. The two colours on the guide-post in the foreground are, as stated in the Explanation, indicative of TWO DESTINIES, according to the decision made. Guide-posts in Württemberg are paiinted by the Government, in the Württemberg colours, black and red, and these suggested to Mrs. Reihlen the two DESTINIES of which she speaks. THE DESIGNER AND THE EXPOUNDER. The beloved writer of the above sketch passed away to his eternal rest and reward on Sunday, May 8th, 1892. His last work on earth was to lecture on his Picture at Sheffield only six days before his death. Of him it may be truly said - he fought a good fight; he finished his course; he kept the faith. The above narrative is from Gawin Kirkham's "History and Explanation of the picture "The Broad and The Narrow Way". THE BROAD AND THE NARROW WAY. Charles Montague Lithographer, 1883 English Edition. Morgan and Scott. Full list of Scripture texts in the Broad and the Narrow Way picture can be obtained here free of charge at the link below.